David Weinberger writes that with a few exceptions, control doesn’t scale and social media makes social control even harder – a point Clay Shirky also makes, although he highlights that its as much about the medium as it is the message. In my mind the development and relationship of information and communication technology (ICT) to control is also a story about the span and speed of that control. Without ICT we would be stuck managing at the speed of the fastest horse, boat or semaphore message and adding up the payroll using an abacus or slide rule. And like management, control in itself isn’t a bad thing – for example, look at the use of social media during disasters in recent years – just the motives behind it. If anything, social media shows that control *does* scale, but in a way that doesn’t require either the efficiencies that are part of a traditional organisational structure or centralised leadership. Sounds like something right out of complexity science don't you think? I missed the morning of day two at Online Social Networking and Business Collaboration (I was attending a seminar on MySource Matrix) but ended up sharing lunch with two Government 2.0 innovators from the speakers line up, Phillip Bower from Centrelink and Dheeraj Chowdhury from the NSW Department of Education (see below). Due to the demographic profile of Queensland’s population, they need to engage with a sparse population across a large geographic area. They investigated the use of YouTube and MySpace as a way to engage with young people, but ended up picking Second Life. They built an island with a public landing area, but the majority of the space is private and accessible only by invitation. During 2007 the held a forum in Second Life to gather feedback on how they might use the space and in April 2008 they held a virtual youth forum to celebrate Youth Week. Automatic capture of a transcripts from the event (for the organiser – however, see my point about voice support above). However, they also identified some issues with using Second Life and these included reliability (I think this was a more general statement about using a hosted solution), ‘griefing’, lagging, legal implications, content moderation, system requirements (in terms of the user’s computer performance), maturity of user’s collaboration skills, and accessibility for people with disabilities. Overall it sounds like there are some real opportunities to use immersive environments like Second Life, but Salvati thinks there are still some barriers to overcome before it becomes mainstream. It was also a reasonably low cost pilot – other than the time and effort of the people involved, they invested less than $1000 in building their island. Dheeraj works in the department’s Centre for Learning Innovation. It provides teaching and educational resources for teachers, students and parents, with a key online presence at TaLe. They are very interested in providing interactive methods for engaging with their community of users – for example, the TaLe site hosts ‘Professional Learning Communities’. Murder under the Microscope is an example of a collaborative online educational game they developed. Include buttons to ‘add this’ and ‘rate this’ everywhere. But, don’t forget, “what’s the fuel? Engagement with the audience”. I actually think Dheeraj has more ideas in his head than he could explain in such a short session – so I’m glad I had the chance to talk to him over lunch! He also talked about his experience of implementing social bookmarking with Scuttle – using only a viral adoption approach,they deployed the solution in just 2 weeks and at a cost of less than $5,000. On the Web, social networking site are becoming “social portals” – however, people probably only have a capacity for using 2-3 different social networks. Statistics on membership show that there is little overlap between different public social networking sites. Different public social networking sites are successful in specific geographies. Also, different cultures use social networking sites in different ways – for example, in the west authentic social networking is the norm, but is less typical in north Asia. Mobile access to public social networking is gradually growing in importance. I think there are some interesting implications for people trying to deploy social networking tools inside organisations, particularly with the reference to portals – an area that continues to produce mixed results in the enterprise. Horne also discussed their success with the MySpace Road Tour and I think that this might also provide an interesting model for the success of social media and social networking inside organisations too – and that is you still need to link the online world back to the real world. Netrepreneurs (4%) - People who accessed the sites for the sole purpose of making money. I would also add to that list, accessibility where ever a Web-connection is available. Google Apps in particular is also revolutionary in the way it gives smaller organisations access to the types of integrated collaboration tools that in the past only larger companies have had access to. Having said all that, Slakey doesn’t believe that hosted applications will replace all traditional applications – instead they will continue to co-exist. But looking at that idea more critically, I do wonder then if organisations will really save money with hosted apps – either they’ll end up with both or Microsoft Office will be evolve into a niche product that will be priced as a specialist ‘power tool’. Really to get the full cost saving you’ll also need to migrate all that macro programming in Microsoft Excel and Word into the cloud. One other interesting point was that Slakey sees an emerging role for an ecosystem of providers that will help organisations both to migrate data to Google Apps (e.g. email accounts, calendars and data etc) and also help them to develop the new practices and skills needed for cloud-based collaboration. I saw Chris Knowles present last year at the Intranets ‘07 conference, so this was a bit of an update for me really on what he has been doing more recently in this space. Heinz have implemented internal blogs and a wiki, an extranet blog and an external social networking site for customers. He explained that the internal tools used simple software options that didn’t need database infrastructure, while the extranet and external social network used cheap hosted solutions. He is a very relaxed presenter and happy to share as much about what has worked at Heinz, as he was about what didn’t work. For example, internal blogging has been more successful than their wiki. However in the process of promoting their new blogging platform to Heinz’s mobile sales staff as an improvement to their intranet, Knowles found he couldn’t assume that people actually even knew what the intranet was! He also told us that he had been asked on a couple of occasions to remove comments. Don’t stop evangelising, encouraging and educating. I also get the impression that in the process of rolling out these different social media tools, Knowles has been prepared to ‘eat his own dog food’ and use the same tools to support how they are used. However, overall I was left wondering if there was any deliberate strategy or plan behind the different initiatives. Also, how much of the long standing knowledge we have about managing Web-forums applies to the situation at Heinz? The key point in Jeremy Mitchell’s story of Telstra’s Now We Are Talking site was the importance of getting high level support so you can be as transparent as possible. Ok. That’s enough about day 1. I’ll blog another post about day 2 next. Phew! Well, the last couple of days have been a process of absorbing a lot of information and ideas from attending the Online Social Networking and Business Collaboration conference, a half-day seminar about the MySource Matrix commercial open source Web CMS and also the last formal NSW KM Forum meeting of the year. I have some notes from the conference to share (day 1 and day 2) and also a write up about MySource Matrix in separate posts to come later…. In the meantime, just a quick mention about the NSW KM Forum meeting, which featured Matt Moore and Serena Joyner – I don’t have any notes to share, but Matt’s slide are already available online and Serena used this video from Step Two’s Intranet Innovation awards as part of her presentation. I’m attending Online Social Networking and Business Collaboration World 2008 in Sydney today but unfortunately a lack of easy access to power and wifi at the venue is limiting my ability to blog and twitter (the hash tag is #osnbc). However, I know that there has been a lot of chatter on the back channel – so far we have had a lot of advertising and few insights. Of course I’m mixing with a crowd of marketers so I’m sure some people would find this interesting. I’m looking forward to the business stream sessions later this afternoon. I’ll blog more when I can. I had heard that Sydney-based content management software company, Elcom Technologies, were launching a new intranet package called IntranetManager.NET, but I’m not sure how I managed to miss the launch event. “For some time at Elcom we’ve deployed our Content Management product, Community Manager, as an Intranet. It has excellent content management, document management, forms, corporate phone book, blogs, wikis, workflow and enterprise search features making it an ideal intranet software choice for a mid-sized to enterprise level businesses. In fact it’s capability as an intranet search engine alone would make it a great choice for an enterprise federated search solution. OK. Now that I’ve had a bit of time to settle in with my new Acer Aspire One, I thought I might contribute back by sharing some of the major issues I’ve found (and beyond the fun tweaks, like installing the Zune theme because I find the colour scheme easier than the standard Windows theme and RocketDock to help with application switching and launching). I started with AA1FanControl to reduce how much the fan was working, but about to try a1ctl. For the moment, I’ve followed some advice to disable the Power Save Mode in the Atheros AR5007EG WLAN adaptor (via Device Manager) as this appears to be a common problem with this model ‘disappearing’ after it goes to sleep to save power, but I will have to wait and see if that makes a difference. The wifi connection comes back eventually, but I would prefer if it didn’t disappear at all! UPDATE: I’ve also installed the Atheros Client Utility to see if that helps. What I also haven’t done yet is attempt a BIOS update, which requires a spare USB thumb drive that you need to make bootable. I’m also a little unclear about the benefits and which version to try (still researching about version 3305 and 3307). There is nothing unique in the brainstorming process itself, but there are some useful tips here about using Second Life (and similar environments) as the medium for your brainstorming meeting. I’ve been a bit quiet this week for a couple of reasons… and one of those reasons is the distraction of getting a new a bit of technology in the shape of an Acer Aspire One netbook. Now, this post isn’t intended to be a review. But for those of you interested in that sort of thing, I picked the Aspire One over some of the alternatives, like the EEE, primarily because I think the keyboard is a little better (compared to the EEE 900 series). I’m running with the Windows XP (150) version, although I was very tempted to pick the hard drive-less Linux (110) version (there is something elegant about no moving parts). However, while overall I’m very happy with the Aspire One, it is by no means perfect so I’ve been busy tweaking it to my satisfaction. Luckily to help me in my quest there is plenty of bottom up support from the global Aspire One community, found in blogs, forums and free software – none of it Acer sponsored of course, but all adding tremendous value. This kind of community support for a product is really quite typical now and in fact I would be worried to find a product like the Aspire One or even the EEE where it didn’t exist (a bit like eating at an empty restaurant). This very much reflects the dynamics of participation described by Clay Shirky in his book, Here Comes Everybody because on its own, Acer could never directly manage that level of engagement itself. All it has to do of course is get out of the way and let it happen. However, another thought did occur to me. Is the hardware itself getting more “social” too? My new netbook doesn’t have built in 3G, but its coming and is already available in some of the higher end laptops. Webcams are almost a standard feature on laptops of all sizes too now. And I was able to add Bluetooth support easily to my Aspire One with a tiny Bluetooth USB dongle. Social hardware, maybe? Ironically the biggest limitation I’ve found with this netbook is really with the software itself – in a way, this new generation of mini-computers is stuck in limbo – the power of full size computer, missing software that is optimised to a 9 inch screen. This isn’t just Windows either, it affects some Web-based apps too. Still, I’m sure with enough community support the software can only get better. Meanwhile the computer manufacturers can stick to what they are good at – making the hardware more and more social. John Tropea: Are you really doing Enterprise 2.0? I went to BarCamp Sydney 4 yesterday (that’s me in the photo during a speed networking session) and had a great time meeting lots of people I know only through twitter and a whole bunch of other new people. I really enjoyed all the presentations I attended. 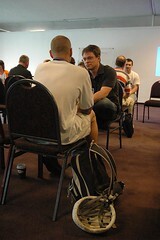 As this was my first barcamp, part of the fun for me was also simply soaking up the atmosphere. In the morning I stepped to the call for participation and talked a little about my ideas on Intranet 2.0, however now that I understand the format I’ll be a little better prepared next time! Kevin Garber (from Spellr.us) who shared his experiences with mixing in the San Francisco tech “ecosystem” (by sharing his story, Garber is helping other local startups). Also, it was great to see people who are passionate about developing the local tech community and also campaigning against the proposed internet filter. Finally, a hat tip to Phil Evans from Evanscorp for the lift and the company on the trip to and from Sydney. I must admit I was a little dubious about this book, worried that this would just be an another evangelical soapbox about Web 2.0. But I should have had more faith in Shirky – Here Comes Everybody turned out to be more and so much better than I expected. This alone has important implications for the whole debate about return on investment (ROI) and enterprise social computing. However there is more and Shirky is able to provide yet more convincing layers of argument and examples of how the impact of this plays out in real life, including our relationship to technology, the media and human behaviour. I won’t describe them here, as the fun part of the book is the observations he makes about these various examples. One other interesting part of this book was a description about audience size and conversational patterns, with particular reference to blogs. Firstly, this model reminds me of Figallo’s model for online communities that I have been using for years. But secondly this describes the death of the blogosphere we have been discussing recently. 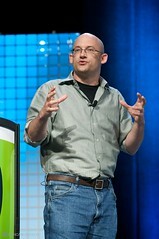 Effectively Shirky says that some Weblogs have such a large audience that they can only operate in a broadcast mode, but as the audience size drops loose conversation and then tighter conversation is possible. Having said that, I would have liked to have seen more discussion about this in relation to the fractal nature of social networks in organisations as I believe that is a key issue in understanding where, how and why enterprise social computing can or doesn’t work. It also makes me curious about the long term success of enterprise social computing tools, like micro blogging, in large organisations if they attempt to retrofit usage back into the organisational structure. There are many interesting things to think about in this book, but my summary here really doesn’t do it justice as the stories and examples that go with these theories are equally important. Overall, this book neither over hypes or provides (easy) answers to the opportunities that Web 2.0 and enterprise social computing (“Enterprise 2.0”) present. What it will do is provide you with some solid background knowledge on why social software is impacting society and the business that is grounded in ideas that, to me at least, make a lot of sense. Here Comes Everybody comes with a definite buy recommendation from me. Photograph courtesy of and copyright James Duncan Davidson. “…in case you are thinking that RSSBus is nothing more than RSS feed generation, that’s definitely not the case. RSSBus allows for input parameters and it can pipe the output of one connector as the input to the next, so it can be used to build advanced information processing systems. RSSBus is providing a important tool to use in the Enterprise RSS Value Chain (I’ll explain more in an Image & Data Manager magazine article coming before the end of the year), but rather than focusing on news feed content it delivers one of the Ten Things I want from Enterprise RSS, a Yahoo! Pipes for the Enterprise. I think this also highlights the dangers of reducing the Enterprise RSS concept to simply news feeds (which we know is an idea that is more palatable to the average user) when there is so much more potential, as the Wallem case study also demonstrates. Hat tip to Lee White. Note: the original video is posted on the Rio Tinto Website, but the version above is from YouTube. “The Australasian Virtual Worlds Workshop is an event for Australasian researchers, educators and business people involved in virtual worlds, to meet and discuss topics related to virtual worlds. More about the death of blogging. When JP talks about the bigger picture of blogging, he manages to interweave a discussion about the US presidential elections, the social history of colonial cities, the quality of discourse in the 1960s and The Cluetrain Manifesto. “Over the seven plus years I have been blogging various people have declared the activity dead, defined it more ways than I can remember and made various pronouncements about how I should be doing it. But I think the point is that both of them are right. Book Review: What's the Big Idea? Error! This Enterprise upgrade requires Change Management 2.0 is installed (some recommended reading around innovation and change management). A lot of my thinking is informed by the sociotechnical systems theory perspective, including organisational theorists such as Karl Weick. I’ve used a simply model from Weick’s earlier work of ‘sociotechnical fit’ to understand the impact of a system change on people and systems. In this model you break the change into two system aspects – the social and the technical. Then break each aspect into the job, work group and organisational view. By analysing the change from each of these components you can look for mismatch between the changes in the social and technical aspects. Obviously there is a little be more to understanding and applying the definitions of these components, but hopefully you get the basic idea. At the workgroup level, it introduced the opportunity to improve the relationship between one business group and another through role clarity. But at a job level, while one stakeholder’s job would be enriched by the new process (more knowledge work because of reduced effort to manage transactions), another previously unrecognised ancillary stakeholder group would need to learn new skills that might not directly enrich their roles (at least without further investigation to understand the pros and cons of the change). I like the way a relatively simply model like this can help to reveal unforeseen issues by helping us to explore the different perspectives of a system change. Of course, the more complex the change, the more important it is to inject a diverse range of viewpoints into a model like this to make sure nothing is missed (i.e. you don’t know what you don’t know). Actually, the main point of both these articles is that blogging technology has changed the Web medium as a whole (by allowing greater participation on news sites and the like, we assume for the better) but meanwhile the A-list bloggers have themselves for the most part morphed into professional publishing and money making organisations, while other new Web communication mechanisms, like microblogging (e.g. Twitter) and activity streams (e.g. Facebook), have emerged to grab the blog author and blog reader’s attention. I’ve recently made similar arguments about blogging, that relate back to a theme I described a while a go as the grey area between using social software as social software and using them for achieving other information management objectives. I believe there is a lesson in the rise and fall of the Blogosphere across the whole of the social computing spectrum, not just blogging. “having to stop writing would hurt me terribly, and if the other contributors of essayists and remarks were to fall silent, that of course would hurt me infinitely more. I agree. The Blogosphere might be dead, but blogging isn’t. Bartlett-Bragg, A., 2003, 'Blogging to Learn' [PDF], The Knowledge Tree, Edition 4, 2003. Brown, J. S. and Duguid P., 2000, The Social Life of Information, Harvard University Press, 2000. Carlopio, J., 2003, Changing Gears: The Strategic Implementation of Technology, Palgrave Macmillan. Cross, R., Parker, A., Prusak, L., Borgatti, S.P., 2001, 'Knowing what we know: supporting knowledge creation and sharing in social networks', Organizational Dynamics 30, pp.100-120. Davenport, T. H., 1994, 'Saving IT's Soul: Human-Centered Information Management', Harvard Business Review, March 1994, pp.119-131. Also see my blog post summary. Dube, L. and Pare, G., 2002, 'The Multi-faceted Nature of Virtual Teams', Cahier du GreSI, no 02-11, November 2002. Evaristo, R. and Munkvold, B.E., 2002, 'Collaborative Infrastructure Formation in Virtual Projects', Journal of Global Information Technology Management, Vol. 5, No. 2, 2002, pp.29-47. Figallo, C., 1998, Hosting Web Communities: Building Relationships, Increasing Customer Loyalty, and Maintaining A Competitive Edge, John Wiley & Sons. Handy, C., 1989, The Age of Unreason, Harvard Business School Press. Johnson, S., 2002, Emergence: The Connected Lives of Ants, Brains, Cities, Scribner, New York. Madanmohan Rao (ed. ), Knowledge Management Tools and Techniques, Elsevier, 2004, London. McAfee, A. P., 2006, 'Enterprise 2.0: The Dawn of Emergent Collaboration', Sloan Management Review, Spring 2006, Vol. 47, No. 3, pp.21-28. Munkvold, B.E., 2003, Implementing Collaboration Technologies in Industry: Case Examples and Lessons Learned, Springer-Verlag, London. Negroponte, N., 1996, Being Digital, Vintage Books. O'Reilly, T., 2005, What Is Web 2.0: Design Patterns and Business Models for the Next Generation of Software. Porter, M. E., 1998, Competitive Advantage: Creating and Sustaining Superior Performance, Free Press. Rogers, E. M., 2003, Diffusion of Innovations, 5th ed., The Free Press, New York. Stenmark, D. (2001). "The Relationship between Information and Knowledge" [PDF]. In Proceedings of IRIS-24 , Ulvik,Norway, August 11-14. Surowiecki, J, 2004, The Wisdom of Crowds: Why the Many Are Smarter Than the Few and How Collective Wisdom Shapes Business, Economies, Societies and Nations, Double Day. Woods, D. and Thoeny, P., Wikis For Dummies, 2007, Wiley. Feel free to add your own suggestions below for other articles, papers and books you recommend. Bailey, C. and Clarke, M., 2000, ‘How do managers use knowledge about knowledge management’, Journal of Knowledge Management, Vol. 4, No. 3, pp.235-243. Beckett, R. and Murray, P., 2000, ‘Learning by auditing: a knowledge creating approach’, Journal of Knowledge Management, Vol. 12, No. 2, pp.125-136. Calvert, M., 2001, ‘CEO Update: Measuring the Success of Enterprise Knowledge Management’, The Monthly Research Review, Gartner, Jan. 2001, pp..5-7. Carlopio, J., 1998, ‘Implementing Innovation and Technical Change’, Training and Development Australia, Feb. 1998, pp.9-10. Cross, R., Parker, A., Prusack, L., Borgatti, S. P., 2001, ‘Knowing What We Know: Supporting Knowledge Creation and Sharing in Social Networks’ [PDF], Organizational Dynamics, Vol. 30, No. 2, pp.100-120. Dubois, C. P. R., 1995, ‘The information audit: its contribution to decision making’, Journal of Knowledge Management, Vol. 16, No. 7, pp.20-24. Funes, M. and Johnson, N., 1998, Honing Your Knowledge Skills: A Route Map, Butterworth-Heinemann. Liebowitz J. et al, ‘The Knowledge Audit’, Knowledge and Process Management, Vol. 7, Issue 1, pp.3-10. Rao, R., 2003, ‘From Unstructured Data to Actionable Intelligence’ [PDF], IT Pro, Nov-Dec 2003, pp.29-35. Swash, G. D., 1997, ‘The information audit’, Journal of Managerial Psychology, Vol. 12, No. 5, pp.312-318. Ward, V., 1998, Mapping Meta Knowledge: A cartographic approach to finding knowledge about knowledge [PDF], Knowledge Management Review, Issue 5, pp.10-15. Wexler, M.N., 2001, The who, what and why of knowledge mapping, Journal of Knowledge Management, Vol. 5, Number 3, pp.249-263. I put this list together back in 2004 for a conference workshop on Knowledge Audits, so feel free to suggest some more recent resources as comments. This is probably true – an immersive environment enhances and augments how with interact with people and information, but does it change how we collaborate? Driver makes the point that there are some new skills to learn, but I wonder what other effects it might have, like the emergence of transitory leadership styles in the workplace? BTW I’ve previously blogged about the potential for enterprise metaverses and also in the online version of my Intranet 2.0 article (they are an alternative Intranet 2.0 strategy).